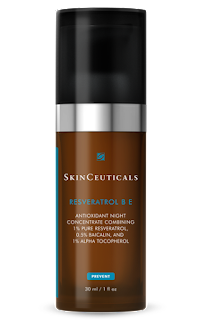 Resveratrol B E Nighttime antioxidant serum for your face & neck. Over the past 10 years, resveratrol has come to be known as the “longevity molecule.” This potent antioxidant helps neutralise free radicals and studies have shown its potential benefits in anti-ageing skincare. 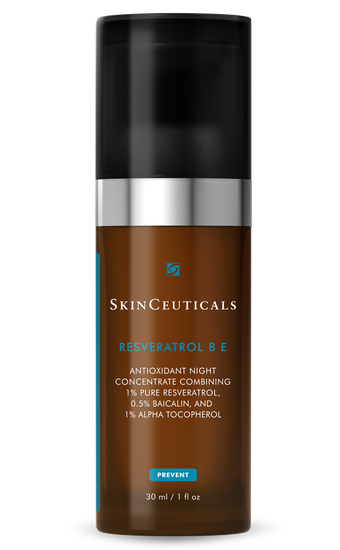 Resveratrol B E combines a maximised concentration of 1% pure, stable resveratrol to help diminish visible signs of ageing caused by damaging free radicals. To enhance its anti-ageing antioxidant benefits, this night treatment features a combination of 0.5% baicalin and 1% pure vitamin E (alpha tocopherol).